For a team oozing enthusiasm about finally having a full training camp under Mike D’Antoni, the Lakers are still missing key ingredients. The most obvious absence involves Kobe Bryant, who has spent the first two days of training camp mixing in team film study while rehabbing his surgically repaired left tendon. The others involve Steve Nash and Pau Gasol, who will sit out in parts of the Lakers’ two-a-day sessions after spending the past offseasons rehabbing their respective hamstring and knee injuries. “I just don’t want them to push it early,” Lakers coach Mike D’Antoni said. Gasol and Nash participated in all of the Lakers’ first practice Saturday morning and most of the team’s morning practice Sunday that consisted of film work and individual drills. But Gasol and Nash will sit out of tonight’s practice session that will mostly involve full-court scrimmages. Gasol and Nash also plant to sit out of the evening portion of the Lakers other two-a-day-sessions scheduled for Tuesday and Thursday. The Lakers hardly had any luxuries last season. They spent all of last year’s training camp under Mike Brown learning elements of the Princeton-based offense, a complicated system based on cuts, passing and various reads based on how opposing teams defend. The Lakers then fired Brown following a 1-4 start and brought in D’Antoni, whose pick-and-roll heavy offense provided a stark contrast both in its pace and simplicity. The Lakers had little time to learn it. Nash, who ran the offense well enough to earn two NBA MVPs in four seasons with the Phoenix Suns, stayed sidelined for seven weeks because of a fractured left leg, leaving the Lakers without a significant piece to build offensive chemistry. Gasol’s 33-game absence included a variety of ailments, including plantar fascia in his right foot, a concussion and knee tendonisis. Nash has reported he’s fully healed from back and hamstring issues that kept him out for the last two weeks in April and the Lakers’ last two playoff games. But Gasol’s health seems less certain. His practice on Saturday marked the first time he participated in significant basketball drills since undergoing a procedure in May that reduced the pain in his knee tendons. 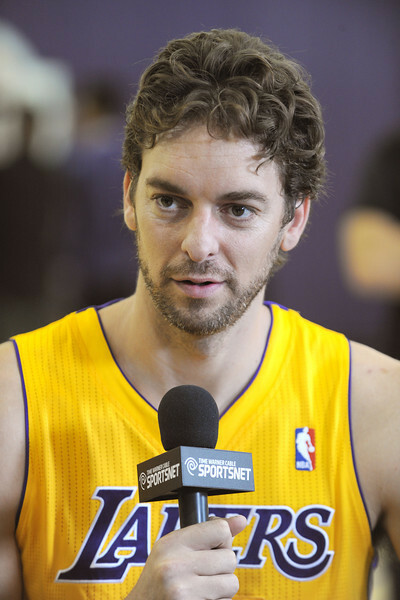 Will Gasol appear in the Lakers’ preseason opener Oct. 5 against Golden State in Ontario? For now, however, Nash and Gasol will have to stay patient. The Lakers will have some challenges beyond Bryant’s absence, as well as Gasol and Nash pacing themselves. The Lakers also travel to China for a pair of preseason games against the Golden State Warriors Oct. 15 in Shanghai and Oct. 18 in Beijing. The trip entails a 15-hour flight to and from China, a trip to the Great Wall and an NBA-sanctioned clinic. Instead, that could happen if Gasol and Nash happened. Yet, after playing for D’Antoni through four seasons in Phoenix, Nash credited him for helping the team build chemistry through a less-is-more approach. Beyond the Lakers’ three-a-day sessions, they are scheduled to practice no more than two hours. It involves a mix of D’Antoni teaching his offense and defense, watching film, individual drills and scrimmages at an efficient pace. This entry was posted in Kobe Bryant, Lakers, Mike D'Antoni, Pau Gasol, Steve Nash by Mark Medina. Bookmark the permalink.